When you become injured or sick as a result of someone else’s negligence, it’s only fair and right that they should compensate you for any financial hardship their actions have caused you. This can include expensive medical bills, lost wages, and diminished earning capacity. 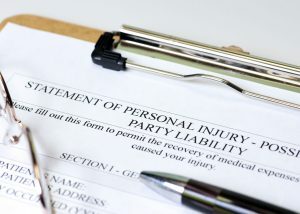 Garretson & Holcomb, LLC helps victims of accidents file personal injury claims and defend them in court if necessary. If you or a family member has recently been hurt due to someone’s misconduct, we encourage you to pick up the phone today. Ohio is one of many states that uses an insurance system that works by assigning fault to parties involved in accidents. In our case, we are beholden to the comparative negligence standard. This means that multiple parties may be found partially or wholly at fault for the damage caused. The percentage of fault directly relates to the percentage of damages one can collect from a personal injury claim. For example, imagine you were rear-ended at a stoplight and are seeking compensation for chiropractic bills. The judge holds the driver who hit you 90% responsible for the accident and you 10% because one of your tail lights was out, therefore contributing to the accident. That means that you are only allowed to collect 90% of the total amount you sought in compensation. A large portion of the work we do for personal injury clients is interfacing with insurance companies on their behalf. When you file a personal injury claim with either your own insurance company or that of the other involved party, you will be probed with many questions. They will try everything they can to goad you into admitting fault in an attempt to avoid paying out your claim. They are so good at doing this that you may admit fault inadvertently or without realizing it, even if you were not to blame for the accident. This is why we communicate with them for you. We have extensive experience speaking with these people and will effectively protect your case while you focus on healing. Garretson & Holcomb, LLC helps injured people in West Chester, Mason, and Hamilton secure compensation following an accident. If you would like to schedule a consultation with a skilled and tenacious lawyer, please contact our West Chester office today at (513) 863-6600.